Alnmaritec Limited, a UK boat builders, has two new boats delivered in 2010 to in the oil spill response/pollution control vessel market. 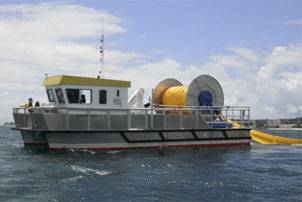 The most recent delivery was a boom deployment and spill response boat which was delivered to the Barbados National Terminal Company Ltd. for operation on their oil export facility at Oistins Bay on the South Coast of the island. 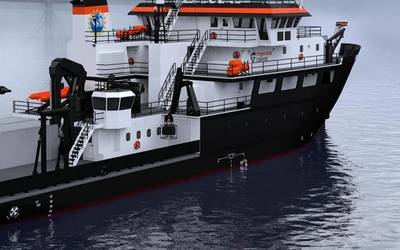 The new vessel Responder 1 is based upon the successful Wave Worker class from Alnmaritec and she is a 39.3 ft long by 17.4 ft wide displacement catamaran design providing a very stable and seaworthy platform. She is powered by twin 150 bhp Cummins diesel engines driving conventional fixed pitch propellers which give her a top speed of 12 knots. She is equipped with an air conditioned wheelhouse, small WC, a five tonne hydraulic deck crane, fresh water wash facilities and of course a range of oil spill equipment. This includes diesel powered dispersant spray pumps and extendable spray arms as well as a hydraulically powered boom reel with 1400 ft of oil containment boom which can be deployed and recovered over a stern roller system making her an extremely versatile vessel. 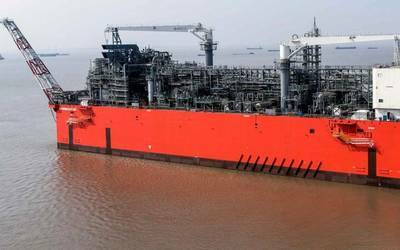 This delivery comes hard on the heels of completion of a high speed pollution response boat earlier in the year which is operated by PetroChina on a refinery at Dalian in Eastern China. The Shi Hua Gang Yi Hao is a 45.9-ft by 16.4-ft aluminium asymmetric catamaran, one of the popular Wave Provider class fitted with twin Volvo D9 425 bhp engines and Hamilton 322 water jets giving her a top speed of over 21 knots with excellent maneuverability. She carries three crew and eight passengers in comfort within the wheelhouse which also contains a WC and externally she has a large working deck serviced by a 6.5 tonne hydraulic crane and she is fitted with a roll over stern and removable tow post for boom handling operations. She carries a range of oil spill recovery equipment including dispersant spray arms, hydraulically powered oil recovery skimmer and pump, steam cleaning equipment and oil storage bladder.